The heisenbug fix, responsible for rampant dopamine-induced madness (DIM), included a glitch that placed our species’ fate in the hands of insane addicts. Driven to satisfy insatiable cravings, unconscious and unconscionable DIMwits derailed human evolution by perverting survival of the fittest into survival of the most self-deceptive, depraved, and inhumane. This fait accompli was accomplished by dopamine’s ability to corrupt innate reasoning capacity. The corruption proved so successful, modern day biologists, geneticists, anthropologists, primatologists, and historians are not much better at grasping dopamine-repellent concepts, such as consciousness being bred out of the species, than the primitives who initiated the process. Dopamine-induced madness provided a staggering array of short-term survival benefits responsible for our ascendants’ impressive ascendancy. Benefits that can best be described as dubious talents for lying, denial, cheating, colluding, betraying, and especially killing, bolstered by an infinite capacity for self-deception, justifying, and rationalizing. I refer to the benefits as short term because the glitch, that continues to favor unconscious, self-deceptive, dishonest, reprehensible addicts, is undermining our species’ chances of long-term survival. One more dopamine-repellent tidbit few DIMwits are capable of digesting. Mencken’s insight holds true for all dishonest cliques, factions, cabals, movements, religions, businesses, organizations, institutions, gangs, and groups. The dopamine glitch continues to protect the madness by facilitating the identification and ruthless elimination of conscious individuals capable of noticing, and foolish enough to threaten the wrong DIMwits’ dopamine flow by questioning and/or challenging their lies, deceptions, hypocrisies, delusions, addictions, and insanity. That’s why history is the story of colluding DIMwits culling the DNA of conscious threats out of, while breeding unconscious into, the species (and never the other way around). Whether we’re called missing links or DIMwits, the dopamine glitch left us behaving more like chimpanzees than rational beings. Dr. Maslow reached his conclusions about missing links after studying, what he referred to as, self-actualized (and others call conscious) individuals. He estimated that significantly less than 1% of the population self-actualize. Additionally, he compiled a short list of shared traits exhibited by a select few, and lacking among the many, including a universal sense of kindness, forgiveness, and compassion, stemming from self-awareness, honesty, reasonableness, objectivity, and reverence for life (aka a disdain for killing). DIMwits and chimpanzees reserve their kinder, gentler, compassionate natures for allies and kin. When it comes to real and imagined rivals, chimpanzees and DIMwits tend to be jealous, vengeful, and scheming political animals, making and breaking alliances for personal gain. Moreover, as Frans de Waal’s research revealed, chimpanzees and DIMwits specialize in deception, collusion, and murder. Backed by the dopamine glitch, our ancestors lied, cheated, and stole whatever they wanted, eliminated dopamine-repellent superiors who threatened their dishonesty, depravity, and esteem, and bequeathed inferior DNA. Succeeding generations of less fit heirs continued the duplicity while hiding behind dopamine-appealing delusions about inherited advantages and fortunes connoting superiority. The unconscious race to the bottom relegated consciousness into the rarest of exceptions for the simple reason that unreasonable DIMwits cannot tolerate reason. Early DIMwits couldn’t know they were denying themselves and their progeny of the birthright to evolve into conscious beings. The killers who parlayed the dopamine glitch into the artificial selection of the species didn’t have to be as clever as the breeders-of-wolves-into-dogs. The primitive bosses simply followed dopamine-induced instincts, which rewarded extra reproductive opportunities to mindless, obedient, cowardly, dopamine-appealing flunkies who helped bosses eliminate the DNA of mindful, honest, conscious, dopamine-repugnant threats. Genetics took care of the rest. Which explains the shortage of conscious, questioning, honest, self-aware thinkers and glut of subservient, opportunistic, unconscious, unquestioning, dishonest, self-deceptive, manipulable, frightened minions who beg to be told what to think. DIMwits can’t handle threats to dopamine flow because the human heisenbug fix produced a glitch that stacked the deck in favor of unconscious killers and against sentient contenders. The purging that resulted in the breeding of DIMwits (rendered incapable of honestly addressing dopamine-repellent choices, beliefs, options, or information) continues to this day. 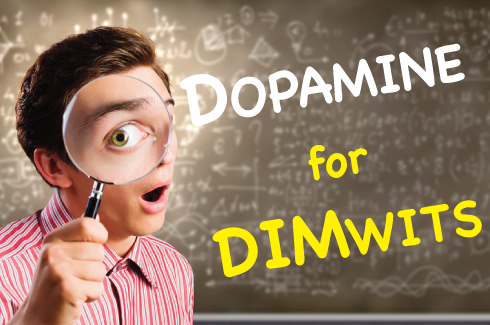 The drive to maintain dopamine flow leaves DIMwits with strong preferences for esteem-boosting, dopamine-appealing delusions of being honest, rational, humane creatures blessed with free will and a stronger enmity for esteem-deflating, dopamine-repellent facts that threaten to expose how irrational, inhumane, self-deceptive, and dishonest we actually are. Which is why, when offered an opportunity to live fulfilling, productive, conscious lives, most DIMwits can’t even consider the possibility a neurotransmitter can and will keep them defending, protecting, and clinging to lies.